To demonstrate this, lets consider an example of Google Map. Lets create a S-Control for the Google Map. Click on “Setup” which is located on the top right corner of the force.com page. am trying to find the S-Control in following location. But its not showing any thing related to S-Control. Did it changed in latest version?. 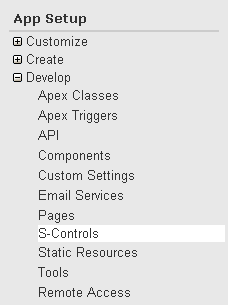 S-Controls are no longer supported by Salesforce. Instead we have to use VF.